I've had this waiting to read for a while and picked a wet and rainy weekend to read it when I was feeling a bit low. I have to say that within a few chapters I realized I had nothing to complain about as I read the awe inspiring story of the authors recovery from spinal trauma. A very well written and inspiring book. “Inspiration is all around us, we just have to open our eyes and notice it.” Steve Fujita has written an inspiring narrative describing his Herculean efforts to recover from an illness-induced spinal cord injury. Initially completely paralysed, he fights his way through to walking and even running over the course of years. The reader marvels at his achievement, made all the more poignant by his understated and modest writing style. To overcome his desperate challenges, he evokes the Japanese concept of "Kaizen" to motivate him: “improvement through small gradual changes.” His tale of courage will amaze you, his physical endurance will inspire you, and his gentle wisdom will move you. Now go get this book! Excellent, inspirational, moving and memorable.I'm so glad I found this book. I love medical memoirs and this sounded a really amazing and inspirational story. I read it in only a few days. Steven Fujita seems to have sinusitis or some sort of virus. He is eventually admitted to hospital with meningitis. As if that wasn't bad enough, things take a turn for the worse and Steven ends up with spinal cord injury. He is unconscious for a while and, when he comes around, he can't speak, eat and has no feeling in his lower limbs. He is paralysed. This book recounts his time in hospital, his long, slow recovery and how far he has come. Steven tells us everything exactly as he remembers it, and, for times he can't remember, he tells us via his medical records. It's so informative; I've read quite a few medical memoirs but here are some conditions mentioned that I didn't know about already. Symptom after new symptom and a scary procedure, so much to contend with. Feeling later came back in his lower extremities and began with one of his big toes-the book title comes from this. It's a long hard slog to get himself going again, all the exercises etc, yet he remained positive, kept rigorously to his given exercise programme and even tried out his own ways of achieving his goals. So determined, never giving up, such drive. He is to be admired. This is an inspiring read for anyone and especially so for anyone having gone through circumstances such as this. It's not just about getting moving again, getting walking again, it's the things you don't think about with lower body paralysis: bladder and bowel function-or rather dysfunction as, if a person can't feel their legs etc, they can't feel the urge to go to the toilet. Even these functions can recover as Steven Fujita shows, it can be possible. Not all plain sailing, not all moving forward-there are hurdles and loss of progress at some points. There are certainly many ups and downs, he says at one point he became tired of reading inspirational stories about others, felt it wasn't happening to him how he'd want. There's a good quote encompassing that whatever it was, he got better, full stop, he's not making any outrageous claims etc, it was hard, it took a long time, but he's better, he's much better and hopefully he will improve some more, even if it's only a little bit. Whatever, he's so thankful and he comes across as a really nice guy. I'm so pleased for him. And he made a great job of this book too. I like his outlook. He doesn't claim anything. He improved, it was time, exercising his muscles, getting them active again. He took supplements later, would they make any difference? He doesn't know, but they didn't make him worse but he started taking them later so he's not advocating any weird and wonderful concoctions, just a supplement to what he was already doing. This makes complete sense: he couldn't walk but, instead of just sitting there, crawled across the floor, like an infant, pulling up on the sofa. This would have helped get him walking again, repeating the process that all children go through to strengthen their legs etc and begin to walk. An excellent book. It just shows this can happen to anyone. Steven wasn't injured or anything like that and he ended up with spinal cord injury. In the back of the book are a few books mentioned that Steven found a great inspiration to him as he was on his road to recovery eg Christopher and Dana Reeve's book-maybe one day someone will have Steven's book listed in their Appendices of inspirational books. Good read for somebody that has or knows a person with a spinal cord injuryHe provided a good timeline of his recovery, medical issues, challenges, motivation etc. Overall, as a person with a SCI, it was worth reading. Steven Fujita - I am a writer based in Long Beach, CA. My genres are supernatural fcition and history. 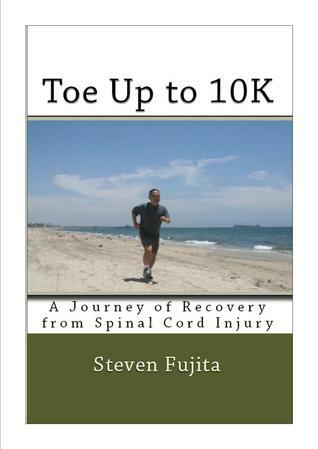 In 2012, I suffered damage to my spinal cord, and wrote a book about my recovery, titled, Toe Up to 10K.